The River Market is buzzing with activity these days, with new development and major infrastructure projects poised to dramatically transform the neighborhood in just a matter of months. Streetcar construction is in full swing, and its impact will be felt in the River Market in particular, where the streetcar route loops through the entire neighborhood on four different streets. In coordination with streetcar construction, physical bicycle facilities are finally being introduced to the River Market on Third Street. Concepts for the reconnection of Walnut and Main Streets are also being explored. New development is under construction at River Market West between 3rd and 4th Streets, and the Centropolis site at 5th and Grand. 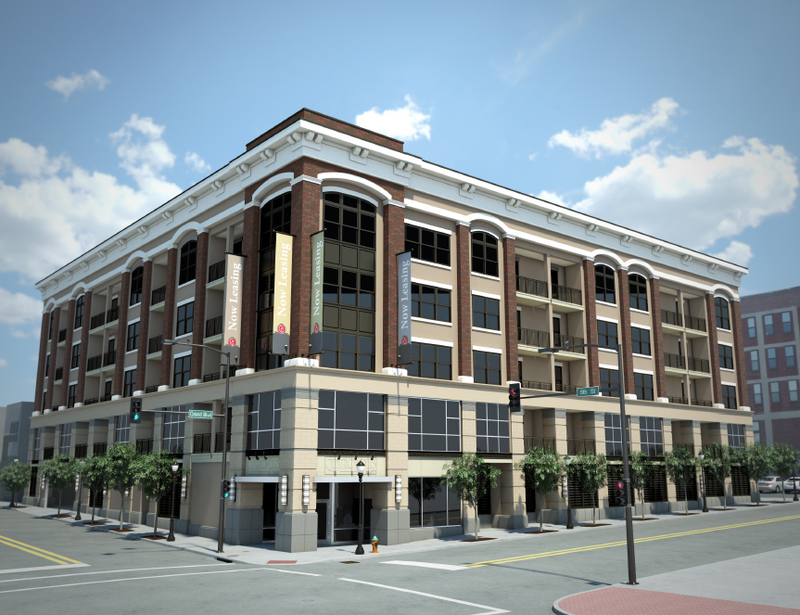 Other projects are in the works at 2nd and Delaware, 4th and Oak, and Missouri and Grand. The City has issued an RFP for the redevelopment of City-owned property surrounding the City Market, and KCATA is exploring transit-oriented development concepts for the park-and-ride lot at 3rd and Grand. The River Market has always been urban and inviting, but it has not always been truly dense and active. All of these projects signal a fundamental commitment to a transition that has been years in the making, from a relatively quiet district (except for market days) with good bones and history to a true urban neighborhood that is dense, diverse, and walkable. As thousands of new residential units come online in the River Market, the neighborhood’s focus is shifting from a sometimes visitor destination to an everyday hub of activity for local residents. With new streetcar service and bike lanes, there is a recognition that walking, biking, and transit will play an increasingly important role in connecting people and places. For the most part, everyone in the River Market seems to be on board with this evolving direction, City leaders, property owners, developers, and businesses included. But change does not come easy. And with all of the ongoing and proposed projects, parking is emerging as the touchstone for angst and tension between the River Market of yesterday and the River Market of tomorrow. On 3rd Street, proposed bike lanes were opposed by City Market operators and adjacent property owners because they would result in the loss of a few dozen on-street parking spaces. Even though the City has been working for years to implement bicycle facilities in the Downtown area, and even though the total parking supply in the River Market is adequate, the City ultimately split the difference, settling on a bike lane on one side of the street with parking and sharrows on the other side. 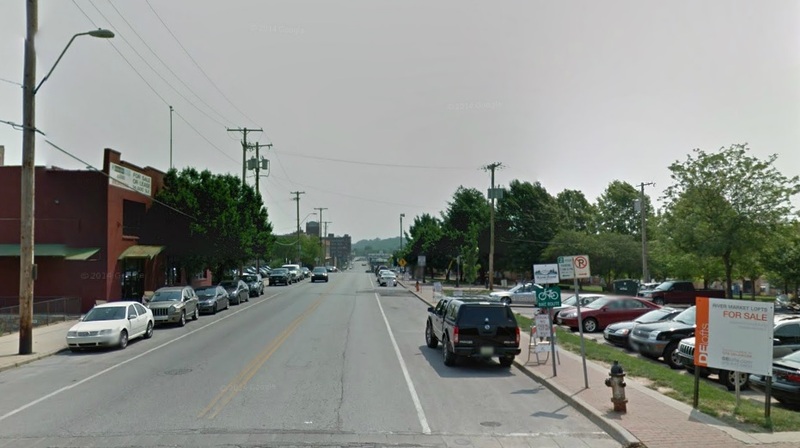 With pressure from adjacent property owners, the City scrapped plans for an eastbound bike lane on Third Street to save these on-street spaces directly adjacent to a parking lot. The north side of the road will include a westbound bike lane. Even though it is being built directly on the streetcar line, the Centropolis project at 5th and Grand devotes its ground floor street frontage to parking, undermining its potential to effectively integrate with and benefit from the premium transit service outside its door. For City owned lots located directly adjacent to the City Market and streetcar line, the City’s “River Market Housing Request for Proposals” stated that “the River Market neighborhood has serious parking issues,” and “replacement of current parking spaces on the site is essential.” Even though the new streetcar is intended to facilitate an environment where you don’t have to drive, and even though the success of the streetcar depends on creating a dense, diverse, walkable environment, the City itself remains fixated on car storage in its most pedestrian-oriented district. 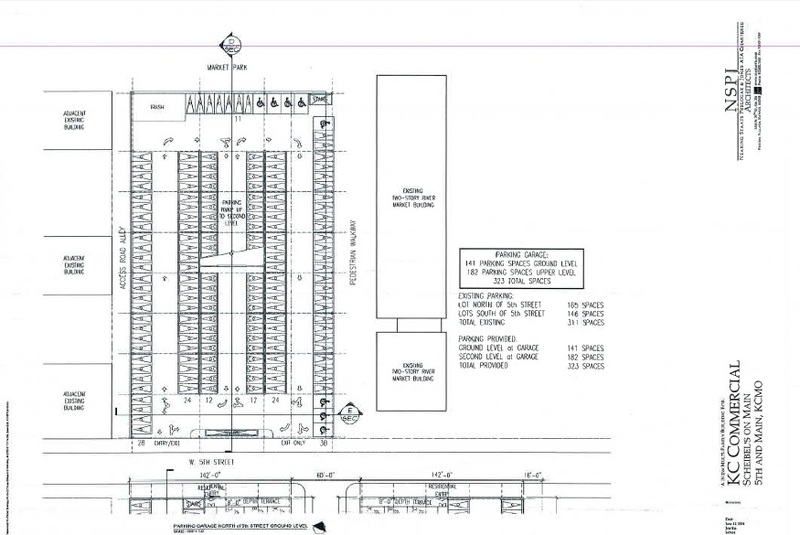 The winning response to the City’s RFP to replace surface lots with new housing just went ahead and proposed more parking instead. In response to streetcar construction, some River Market property owners have indicated a desire to further restrict parking on private lots and enhance enforcement. As Downtown Kansas City continues to grow and densify, it will face parking challenges. Urban Angle’s recent post here highlights some of the challenges and potential solutions for managing parking in a dense urban environment. However, property owner perceptions, recent developer decisions, and City policy are resting on an assumption that there is a genuine parking shortage in the River Market. This is an assumption that deserves to be questioned. It deserves to be questioned because we know that shared parking in walkable mixed-use environments is far more efficient than separate parking for individual uses. It also deserves to be questioned because City policy and nationwide demographic and lifestyle trends are converging on a world where fewer people drive. But most importantly it deserves to be questioned because there is more parking in the River Market than everything else combined. The best approach to understand how much parking the River Market has and how much parking it needs is to do a true parking analysis. A parking analysis would compare all of the public and private on-street and off-street parking spaces in the River Market and then compare this supply to the demand created by all of the residents, businesses, and services in the neighborhood. In the absence of a full parking analysis, Urban Angle took a cursory look at the River Market’s parking situation. Below, marked in red, are the places where you can park in the River Market. With this perspective, angst over lack of parking is not only a bit absurd, it is downright alarming. While the prevailing mindset is that lack of parking is inhibiting development, the reality is that a devotion to parking has created a blight that is step-by-step devouring the neighborhood. Historic buildings are demolished and replaced with parking, new development prioritizing parking in its most visible spaces, and the City infrastructure devoted to walking, biking, and transit is persistently compromised to accommodate car storage. The degree of this parking blight is difficult to understate. There is more land devoted to parking in the River Market than every other use COMBINED. 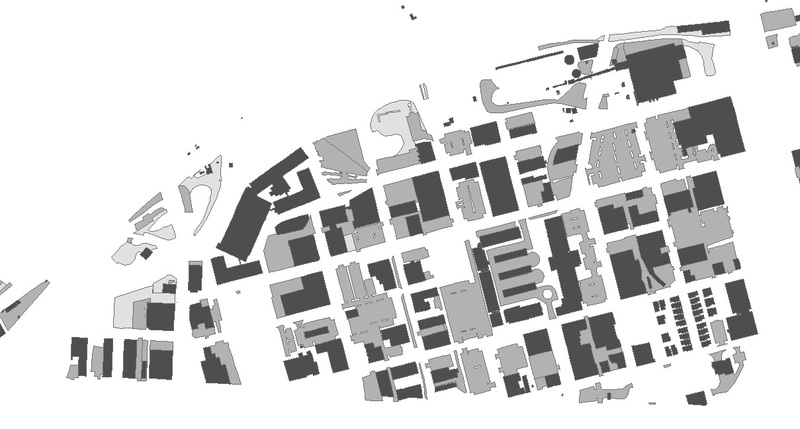 Below is a map of structures and parking areas in the River Market. 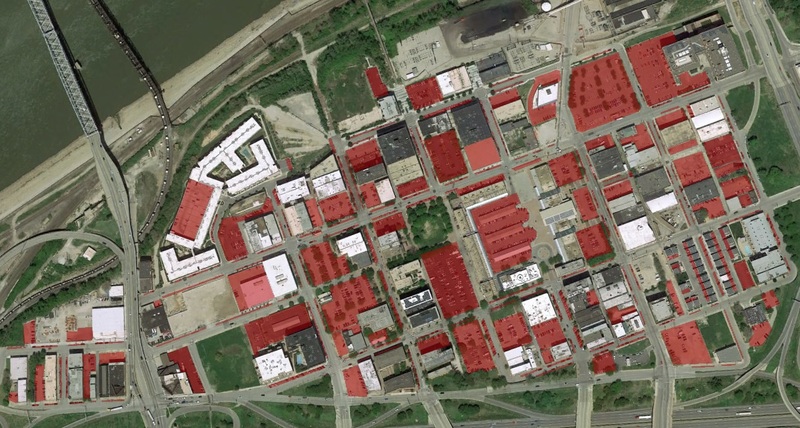 According to the City’s GIS mapping data, development in the River Market consumes about 1,133,000 square feet of land, not including parking structures. This compares to approximately 1,157,000 square feet of space devoted to parking alone. Parking overwhelms what is left of the River Market’s historic buildings stock. In a sad way, we are on a path where parking challenges will eventually solve themselves. As additional blocks are devoted to parking structures, and as active, walkable streets are replaced with parking street frontage, we may eventually erode the quality of place to a degree where fewer and fewer people desire to live in or visit. At that point, our misunderstood and underutilized transit, and our incomplete bike infrastructure, will signal to everyone that we are a real City, once they find a place to park. Not saying you’re wrong, but how many of those parking lots are private resident parking versus public lots? I would guess that the parking situation is a bit unique in the market versus downtown since there’s no underground parking garages. Most every time I try and come to the market on weekends, finding parking is quite difficult and that’s probably what leaders are focusing on, as that’s when the neighborhood is at its most vibrant. Thanks for your comment! I do think that private, restricted lots are part of the problem. It’s less efficient, and pushes the construction of more parking than is really necessary. It’s just not a good way to manage parking in an urban neighborhood. My experience on Market Days is a bit different from yours. While it is always busy, and spaces directly at the Market can be scarce, I have never had trouble finding a spot within a couple blocks. Of course, all of the residents who live in the Market don’t need to find a spot at all, and that number is growing. Many (most?) of the renters on the west side of the area park on the street. The public lot in the old Populous building (4th & Wyandotte) is always empty. The River Market West has spots reserved for that building but renters park on the street instead as it is free. Same is true for the Richards/Conover building at 5th & Wyandotte. They have a lot but renters use the street to save money. Right, that is the problem being discussed here. Inefficient, single use parking destroys neighborhoods like this. For our urban areas to be both dense and have sufficient parking, lots and garages must share spots for different uses. No more parking lots for just one business or building only. It is stupid and inefficient. And as Thomas said, I also have never had trouble parking in the market, even on weekends. I’ve never had trouble parking anywhere in the city. I also don’t mind walking a few blocks. I think most people who have trouble finding parking spots expect to be able to park right out in front of their destination. When they can’t do this, they freak out! Basically, some people aren’t meant for the city. Hopefully they learn over time to handle it, but some people are just so rooted in suburban behavior that they may never escape it. Whenever I drove (I no longer drive as I have chosen to go carless here in KC, and am loving it!) places downtown I would usually just go a couple blocks away from my destination right away, where I no less people would be looking to park. There are always street parking spots available at certain points downtown. Its like people just don’t even know have the downtown blocks exist! Don’t fear walking to your destination. Embrace it! Maybe some people aren’t “meant for the city” but, on the other hand, for suburbanites trying to enjoy the city, we don’t do a great job of making it easy either. Signage is inconsistent and confusing – take the big lot that goes from 5th up to 3rd and Wyandotte east almost to Delaware. I park there for work and that used to be a public lot for people going to the Farmhouse, Quay Coffee, etc. It’s now “private parking” for the most part but the signage is almost non-existent to that end.